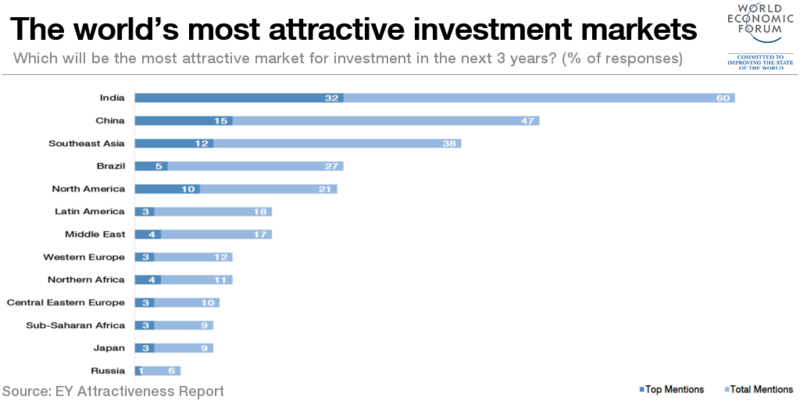 Which country attracts the most investment? India is the world’s most attractive market for investment, according to a new Ernst & Young report, with 32% of international investors rating it as the best place to do business. The following chart shows the percentage of respondents who ranked a country first, and then total mentions among the top three investment destinations. In addition to the 32% of international investors seeing India as the most attractive destination, the country also features in 60% of investors’ top three spots. Second on the list is China, with 15% and 47% respectively. South-East Asia, in general, completes the top three, with 12% and 38%. Respondents believe that the growing opportunities for investors in India are down to ongoing economic reforms. Enthusiasm for India was also strongest among companies with annual revenues exceeding $2 billion. Some 71% of respondents from big companies rated the country as more attractive than other regions. On top of its economic reforms, the report attributes India’s appeal to low labour costs and the enormous size and increasing wealth of the market. How can India’s growth benefit all its citizens?